Man’s best friend got to go to lunch, have a drink and socialize a bit Sunday at the Gladstone Tavern, which held a special event for the canines, “Dine with your Dog.” For a $10 donation, dogs were able to join the rest of the family on the patio for lunch, and raise money for Home for Good Dog Rescue…. Take your dog on a dinner date! Gladstone Tavern, 273 Main St., in Gladstone, NJ, will host its 12th annual “Dine With Your Dog” event to benefit Home for Good Dog Rescue on Aug. 26…. Residents kicked back and enjoyed some family time Sunday afternoon, Aug. 12, all while benefiting a great cause…. Rescue dogs will be seeking perfect forever homes at Home for Good Dog Rescue’s Eighth Annual “Bark-a-Que” & Dog Adoption Event, to take place at Planet Honda in Union, NJ on Sunday, Sept. 9…. Home for Good Dog Rescue was proud to partner with NBC and Telemundo for Clear the Shelters 2018…. The Ryan McGurl Team of Prominent Properties, Sotheby’s International Realty in Westfield, has launched a new partnership with Home for Good Dog Rescue…. When we think of The Real Housewives of New Jersey we think of food: cookbooks, pizza restaurants, throwing lunchmeat, and smashed cakes as far as the eye can see. But New Jersey isn’t just about literally feeding your stomach; it’s also about feeding your soul, specifically with this heartwarming dose of precious, adoptable dogs from Home for Good Dog Rescue…. Home For Good Dog Rescue is hosting a dog adpotion event on Saturday at the PetValu, 177 Washington Valley Road, in Warren…. The pilot killed in a fatal North Jersey plane crash earlier this month used his plane to give hundreds of rescue dogs new homes…. Home for Good Dog Rescue’s “Bow Wow Brunch” will be held at the Grand Summit Hotel on May 6…. When Summit resident Kristine Duetsch first began researching Home for Good Dog Rescue at the end of 2016, she had done so for one reason; to potentially adopt a rescue animal into her home. However, after rearranging her dining room table, designating the room a “puppy area” and deciding to take a chance on touching even more lives, she and her family have personally housed nearly 200 deserving dogs over the last 14 months as part of the Berkeley Heights-based non-profit’s unprecedented foster program. “I wanted to adopt, and my husband said…. The busiest spot at Saturday night’s Home For Good Dog Rescue’s fundraiser was the kissing booth! Guests of all ages lined up to pay $1 to be kissed…by a puppy! Home for Good Dog Rescue will host a “Taste of Italy” dinner and tricky tray on March 3 at 6:30 p.m. The event, which will be held at the Long Hill Community Center at 264 South Warren Ave., Stirling, will feature a full spaghetti and meatball dinner followed by a basket auction for items including gift certificates, televisions, iPads, laptop computers and luxury housewares…. Guests can win more than 100 prize baskets, enjoy a full-scale Italian-themed dinner, take part in a super 50/50 raffle, and make a tangible difference to thousands of rescue dogs on March 3 as Home for Good Dog Rescue’s annual “Taste of Italy” Spaghetti & Meatballs Dinner and Tricky Tray returns for the ninth consecutive year to the Long Hill Community Center, 264 S. Warren Ave. in Stirling…. Sadie is a 5-year-old Labrador retriever in the care of Home for Good Dog Rescue. Saved from a high-kill shelter in Georgia, she has been described as an active dog who is calm indoors…. In September, Schreiber adopted two dogs while he was waiting backstage before his appearance on Live With Kelly and Ryan. The pups were brought to the show by Home For Good Dog Rescue, an organization that raised awareness about the animals displaced by Hurricane Harvey…. Kingsley, the purebred English Springer Spaniel, is recuperating after surgery that saved his leg. He will be looking for his “forever home” in early 2018. Kingsley’s journey to New Jersey began when Home for Good Dog Rescue wanted to help save his leg. Kingsley was hit by a car that crushed his back leg and specialized surgery was necessary to save it from being amputated…. A 7-month-old rescue dog will earn his wings this Sunday as Home for Good Dog Rescue flies him to New Jersey for a surgical procedure that will save his leg from amputation Kingsley, a purebred English Springer Spaniel, and 15 other dogs from Home for Good Dog Rescue’s Aiken, SC rescue facility will board the plane of New Jersey pilot Thomas Callahan to land at Morristown Municipal Airport at 2:30 PM on Dec. 10…. Norbit is a 4-month-old Great Dane mix in the care of Home For Good Dog Rescue. Described by volunteers as “quiet and reserved,” Norbit gets along well with cats and both large and small dogs…. Mayor’s Round Table is a monthly show hosted by Dr. Donald DeFabio, who sits with Mayor Robert Woodruff to talk about current issues that affect the township.Included in this episode, Dr. DeFabio talks with originators of the Berkeley Heights Winter Walk Bobbie Peer, owner of TAPinto Berkeley Heights, and Cheri Pertesis, owner of Anything Floral…. This Facebook live video featured 21 Home for Good Dog Rescue puppies interacting with television personality Jon Stewart to raise awareness for Next for Autism in conjunction with the “Night of Too Many Stars” on HBO Saturday, November 18, 2017. This issue featured a full-page advertisement seeking volunteers and supporters for Home for Good Dog Rescue in the Aiken, SC area. Naomi rugged up in a black jacket paired with jeans and a striped scarf, which she teamed with a pair of well worn black cowboy boots. The ex partner of Liev Schreiber juggled a cup of coffee as she carried what appeared to be her son’s musical instrument…. This feature story on Maryann Cantor, a long-time Home for Good Dog Rescue foster, details her move to Berkshire Hathaway HomeServices New Providence Office. Following our appearance on the show on September 6, 2017, LIVE! announced the adoption of Texas dog Shyanne, the last remaining of the Hurricane Harvey dogs Home for Good helped rescue. Home for Good Dog Rescue dogs were walked by Al Roker, Matt Lauer, and Bob Harper of ‘The Biggest Loser’ in a demonstration for wellness and fitness. Following our initial appearance on the show on September 6, 2017, LIVE! plugged Home for Good Dog Rescue Texas dog Shyanne, who was the last of our Saving Hope Foundation animals seeking a permanent home. MAX Challenge New Providence stepped up to give back to Home for Good Dog Rescue in Berkeley Heights, raising almost $900 from their morning classes and hosted an adoption event at their store last Saturday — and 10 puppies found their forever homes…. Ben is a 11/2-year-old hound mix in the care of Home for Good Dog Rescue…. Talk about ‘throwing the dog a bone’. Current — and future — Hilltop City and surrounding community canines are set to rejoice, as September 9 will see not one but two doggone good events geared toward the four-legged set. Home for Good Dog Rescue’s Seventh Annual “Bark-A-Que” will be held at Springfield’s Meisel Park, the same day as Summit’s “Doggy Dip” at the Family Aquatic Center…. Among the organizations stepping in to help the areas affected by Hurricanes Harvey and Irma are The American Red Cross, UNICEF and animal shelters around the country. Each of these organizations help in different ways and do impactful work and the generosity from animal shelters outside the south housing animals from shelters in Houston, Texas and Florida is just as important as the other recovery efforts…. In the wake of Hurricane Harvey, this article highlighted Home for Good’s Texas rescue efforts with the Saving Hope Foundation. She rescued her cute puppies from Hurricane Harvey. And Naomi Watts and her two sons took the dogs out for a morning stroll in New York on Monday. The 48-year-old actress wore a tweed jacket over a white T-shirt along with blue jeans while she walked alongside 10-year-old Alexander and eight-year-old Samuel…. The Bark-A-Que dog adoption event was held Saturday at Meisel Park in Springfield. This event is run by Home for Good Dog Rescue of Berkeley Heights. Public Relations and Social Media Coordinator, Matthew Holowienka stated, “the new park was wonderful, the location and event exceeded all of our expectations”. It had been previously located on the Green in Summit…. Naomi Watts and her sons treated their new Hurricane Harvey rescue puppies to a visit to a dog park Sunday in New York City. The 48-year-old actress wore a faded denim jacket over a white T-shirt along with blue jeans while out with 10-year-old Alexander and eight-year-old Samuel. The programme was due to feature the dogs, who had all come from an animal shelter in Texas which had been damaged by flooding. All the dogs were being put up for adoption, and instead of doing nothing, the ‘Ray Donovan’ took it upon himself to make sure at least two of the pooches now have a loving home to go to…. Her ex-partner of 11 years Liev Schreiber adopted two adorable six-month-old puppies that survived Hurricane Harvey on Wednesday. And showing the strength of their relationship, Naomi Watts was seen walking the two newest canine additions to her family in New York City on Friday…. There’s another story of hope after the devastation of Hurricane Harvey. The nationwide effort to help has led to a new life for two rescue dogs. The dogs, a brother and sister, are from Texas, and they are now living the good life in the Big Apple with actor Liev Schreiber. Here’s how it happened…. Liev Schreiber may play a tough guy on “Ray Donovan,” but his heart turned to mush Wednesday when he met some puppies affected by Hurricane Harvey. The actor was backstage at “Live With Kelly and Ryan” as he came upon the pooches, who were moved from a Texas shelter to make room for dogs displaced by the catastrophic storm, according to the show. Liev Schreiber adopted two adorable six-month old puppies that survived Hurricane Harvey while backstage during his appearance on LIVE! With Kelly and Ryan on Wednesday…. Liev Schreiber, the star of TV’s “Ray Donovan” and the Oscar-winning “Spotlight,” has adopted two puppies displaced by Hurricane Harvey in Texas. The 49-year-old actor was a guest on the syndicated “Live with Kelly and Ryan” on Wednesday and met a pair of refugee pups backstage that were brought to the show by Home for Good Dog Rescue to promote adoptions…. On Saturday, the Coldwell Banker Residential Brokerage office in Mendham and Home for Good Dog Rescue will join hundreds of Coldwell Banker offices and animal shelters around the country for the Coldwell Banker “Homes for Dogs” National Adoption Weekend. Rescues from Texas through The Saving Hope Foundation will be at the event…. Liev Schreiber Adopts Rescue Puppies from Texas at LIVE! After appearing on “Live with Kelly & Ryan,” Liev Schreiber adopted two puppies featured on the show who were moved from a Texas shelter to make room for dogs displaced by Hurricane Harvey. This episode of LIVE! features dogs Home for Good Dog Rescue rescued from Texas with the Saving Hope Foundation, Inc. in the wake of Hurricane Harvey. Guest Liev Schreiber adopted two of those rescue pups that day! PEOPLe featured a recap of Liev Schrieber’s adoption of two Home for Good rescue dogs following their appearance on LIVE! with Kelly & Ryan. Liev Schreiber came empty-handed to Live With Kelly and Ryan on Wednesday, but left with two adorable puppies. The Ray Donovan star was waiting backstage before the show when he encountered a whole lot of sweet dogs from Texas who had been displaced by Hurricane Harvey and brought to Live by members of the Home For Good Dog Rescue, to raise awareness of about the plight of animals in the areas divested by the natural disaster. Meisel Park will ‘go to the dogs’ this year as Berkeley Heights-based Home for Good Dog Rescue brings its Seventh Annual “Bark-a-Que” & Dog Adoption Event to Springfield, NJ for the first time on Sept. 9…. It wasn’t the first time barks could be heard from planes landing in the Morristown Municipal Airport, and it won’t be the last. Twenty-five dogs and one kitten landed in two planes coming from a devastated Texas to New Jersey to be fostered and adopted through 11th Hour Rescue and Home for Good Dog Rescue…. This year’s Home for Good Dog Rescue’s 7th Annual BARK-A-QUE will be held on September 9 at Springfield’s Meisel Park. This is a change of venue for the event and the first time it will be held in Springfield. The event goes from 11 a.m. to 4 p.m. and organizers expect to reach the 5,500 dogs adopted level at the BARK-A-QUE…. New Jersey animal rescues are continuing to help displaced pets in Texas as Home for Good Dog Rescue accepts another 30 rescue dogs. Home for Good Dog Rescue worked with Saving Hope Foundation and the Rev. Andrew Topp, a New Jersey-based pastor and pilot, to fly to Texas on Saturday to provide supplies and relief to Hurricane Harvey victims and return with at least 30 dogs…. New Jersey-based pastor and pilot will fly to Texas this weekend to provide humanitarian aid to victims of Hurricane Harvey and then return Monday, Sept. 4 to Morristown Municipal Airport with 30 displaced rescue dogs through a joint effort with Home for Good Dog Rescue…. Meisel Park will go to the dogs on Sept. 9 when Home for Good Dog Rescue holds its seventh annual “Bark-A-Que” and dog adoption event from 11 a.m. to 4 p.m…. This year’s Home for Good Dog Rescue’s 7th Annual BARK-A-QUE will be held on Sept. 9 at Springfield’s Meisel Park. This is a change of venue for the event and the first time it will be held in Springfield. The event goes from 11 a.m. to 4 p.m. and organizers expect to reach the 5,500 dogs adopted level at the BARK-A-QUE…. Meisel Park will “go to the dogs” this year as Berkeley Heights-based Home for Good Dog Rescue brings its seventh annual “Bark-a-Que” & Dog Adoption Event to Springfield for the first time on Sept. 9…. Home for Good Dog Rescue animals modeled must-have pet products as part of August’s “Stuff We Love: Pets Edition” with Today’s team of co-anchors. This feature story on pilot Paul Steklenski of Flying Fur Animal Rescue, Inc. features Home for Good Dog Rescue animals he transported to New Jersey from South Carolina. Home for Good Dog Rescue put in an appearance alongside pet trainer Andrea Arden to spotlight summer dog safety tips with Hoda Kotb, Savannah Guthrie, and more. Shorty is a 6-month-old female beagle mix in the care of Home for Good Dog and Animal Rescue…. Looking for your next warm and fuzzy family member? Check out these 6 adorable pets ready for adoption through Home for Good Dog Rescue in Summit and Berkeley Heights…. Looking for your furever fur buddy? Check out these dogs who are ready and up for adoption at Home for Good Dog Rescue in Summit and Berkeley Heights…. Girl Scout Troop 65631 was honored during the Watchung Borough Council meeting on Thursday, June 1 for receiving their Bronze Award. From left are Troop Leader Carolyn Solon, Jenna Maziekien, Marisa Piccininni, Isabelle Motta, Mayor Stephen Pote, Kayla Nunes and Kendra Taylor…. Heidi is a 1-year-old, 60-pound bluetick coonhound mix in the care of Home for Good Dog Rescue…. In order to raise funds for Home for Good Dog Rescue, a foster-based dog shelter located in Berkeley Heights, Cranford’s Nomahegan Park hosted a 5k run and doggy dash on April 30. Registration began at 8 a.m. as runners and their dogs arrived at the park. They received a bandana and treat bag for their pets prior to the race…. This issue features a calendar listing for the 2nd Annual “Bow Wow” Brunch and Tricky Tray featuring Eyewitness News anchor Michelle Charlesworth. Home for Good Dog Rescue appeared alongside dog trainer Andrea Arden of Andrea Arden Dog Training to spotlight dog safety and health tips in regard to grooming and travel. The long driveway stretches back among lofty pecan trees to Almost Home, a wellness center in Aiken, South Carolina, for dogs lucky enough to be rescued and taken there…. Area residents came together over pasta and puppies on Saturday, March 4 at the Long Hill Community Center…. Even an unexpected snowstorm could not stop a 1-year-old shelter dog named Travis from finding a permanent family of his own and becoming Home for Good Dog Rescue’s milestone 5,000th adoption on Jan. 7That Saturday, the New Jersey-based nonprofit organization hosted its first adoption event of 2017 and welcomed the public to its facility in Berkeley Heights to meet its rescue dogs…. A group of girls packed up their red wagon and walked through their Berkeley Heights’ neighborhood selling food, drinks and crafts [they made themselves] and donated the proceeds to Home for Good Dog Rescue…. The Jenkins County K-911 Rescue organization now has a home base for its operations. The Jenkins County Commissioners have agreed to lease to the group for three years a building located at the Millen/Jenkins County Airport on Hwy. 25 North for use as an animal rescue shelter…. Even an unexpected snowstorm could not stop a 1-year-old shelter dog named Travis from finding a permanent family of his own and becoming Home for Good Dog Rescue’s milestone 5,000th adoption on Jan. 7…. 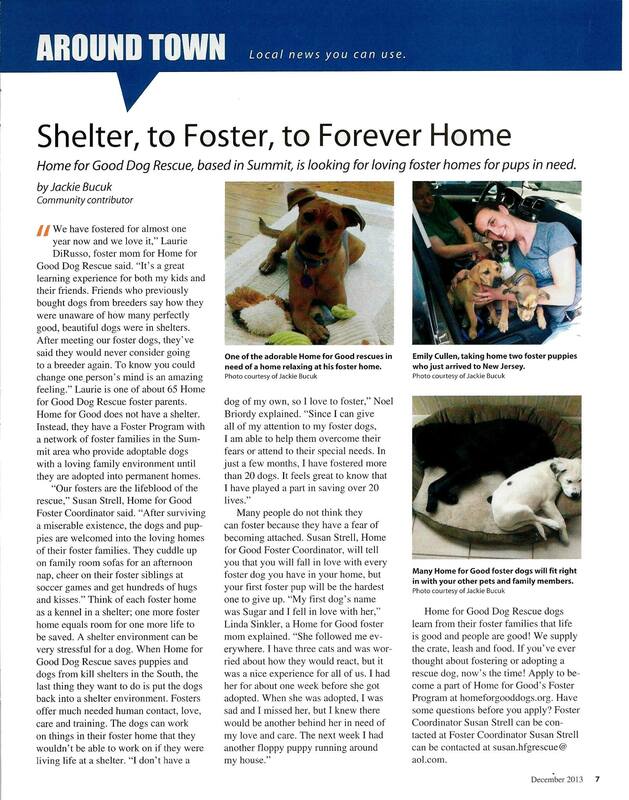 This issue featured a spotlight article on Home for Good Dog Rescue and its team. Downtown Berkeley Heights will be transformed into a holiday wonderland for one magical evening on Saturday, December 3 to kick off the holiday season in grand fashion with tree lighting, firework show and the second annual Winter Walk…. On a sweltering morning in late July, four high school students from New Jersey are at the Aiken, S.C. headquarters of Home for Good Dog Rescue preparing for a mission…. Home for Good Dog Rescue, of Berkeley Heights, held its annual “Bark-A-Que” on Saturday, Sept. 10, at Summit’s Village Green. The event consisted of vendors and contests for dogs and owners, while providing many of them a chance to reconnect with the organization. There was also an opportunity for more dogs to be adopted…. Non-profit organization Home for Good Dog Rescue will launch its Sixth Annual “Bark-a- Que,” a celebration of the 4,500 dogs the organization has rescued since its inception in 2010, on Saturday, Sept. 10 from 11 AM to 4 PM on the Village Green in Summit, NJ…. The non-profit, Berkeley Heights-based organization Home for Good Dog Rescue will hold its sixth annual “Bark-a-Que,” a celebration of the 4,500 dogs the organization has rescued since its inception in 2010, on Sept. 10 from 11 a.m. to 4 p.m. on the Village Green in Summit…. Walk through the doors of Battle Hill Elementary School in Union, and you will see the “Wall of Paws,” a bulletin board overflowing with photos of dogs and cats, and even some birds and lizards…. I thought you may like this photo of a dog rescue flight I did in April 2016 from Aiken, SC to Morristown, NJ to help Home for Good Dog Rescue. I flew 24 pups in my Cherokee 6-300…. Eve is a hound/pointer puppy in the care of Home for Good Dog Rescue…. Ten dogs found their forever homes at Home for Good Dog Rescue’s Grand Re-opening event on June 18th. The celebration welcomed the public to the Berkeley Heights-based non-profit organization’s newly renovated retail shoppe and grooming space located at 465 Springfield Ave. in Berkeley Heights, NJ…. Second grade students in Battle Hill Elementary school in Union expressed an interest in helping animals and raising money for that cause. Their teachers, Abby Polizzi and Alexandra Aiello, facilitated the effort and the result has been rewarding in many ways. Together, they set up a bulletin board named “Wall of Paws” at the main entrance to Battle Hill School…. Seamus is a 3-year-old Labrador retriever/hound mix in the care of Home for Good Dog Rescue…. This issue featured an adoption event at Virtue Tile, hosted by a Home for Good Dog Rescue adopter at his place of business in Summit, NJ. Berkeley Heights-based nonprofit organization Home for Good Dog Rescue will host a Grand Re-opening Event on Saturday, June 18 to celebrate the launch of its newly renovated retail shoppe and expanded dog grooming services…. Home for Good is featured in a local listing as an animal rescue organization. Home for Good Dog Rescue will host its annual Spring Yard Sale this Friday and Saturday at its offices, 465 Springfield Ave. in Berkeley Heights. Donations of gently used clothing, toys, household items, furniture, costume jewelry, and other similar items may be dropped off from April 13 onward…. Tickets are still available for Home for Good Dog Rescue’s annual “Taste of Italy” Spaghetti Dinner & Tricky Tray…. Kane is a 4-year-old bluetick coonhound in the care of Home for Good Dog Rescue…. Students in the “Main Street Philanthropy” project at Boonton High School raised nearly $500 over the holiday season to support “Good Dog Rescue” in Berkeley Heights. Boonton High is just one of a few schools in the state who participate in the non-profit “Main Street Philanthropy” program…. When students from Boonton High School arrived at Home for Good Dog Rescue in Berkeley Heights on Dec. 23, they were greeted by a 10-week-old Australian Shepherd puppy named Everett…. A 10-week-old Australian Shepherd puppy named Everett was among those to greet the school bus that arrived at Home for Good Dog Rescue in Berkeley Heights on Dec. 23. And thanks to the generosity of 17 Boonton High School students, he and other rescue dogs under the organization’s care may find permanent homes this holiday season…. Summit-based nonprofit organization Home for Good Dog Rescue celebrated its milestone 4,000th adoption on Nov. 28 as part of a special two-day event hosted at its offices in Berkeley Heights, NJ…. When they first started rescuing dogs from kill shelters in the deep south, the founders of the Berkeley Heights-based Home For Good Dog Rescue — modestly working out of a nearby Summit home — gave themselves a rule…. So you want a foster dog? 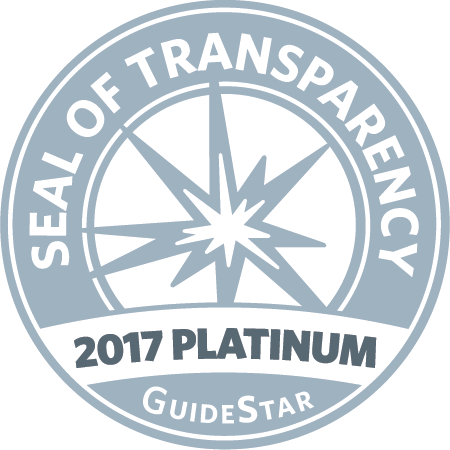 Home for Good Dog Rescue is featured in a listing of animal rescue organizations with established dog fostering programs. Thirteen-year-old Roosevelt student Lily Kaplan loves her dog, Gizmo. But Gizmo wasn’t always loved. Along with several other dogs, Gizmo lived in a crate until the day they were dumped at a shelter by an uncaring breeder in Georgia, she explained…. Nearly thirty dogs found permanent homes at Home for Good Dog Rescue’s Fifth Annual Bark-a-Que on Sept. 12…. Home fo Good Dog Rescue is moving ahead with plans to build a state-of-the-art dog wellness center in Aiken. This facility, called Almost Home, is a place where the organization will be able to house dogs pulled from local shelters before sending them to homes in Northern states…. Summit-based Home for Good Dog Rescue invites the local community to the fifth annual Bark-a-Que, a celebration of the 3,800 dogs the organization has rescued since its inception in 2010…. Home for Good is featured in a listing of New Jersey-based animal rescues. Home for Good Dog Rescue was named on Today Show Radio, featuring information about our weekly Transport Program, about our unprecedented Foster Program, about the conditions from which many of our dogs come, and about our vision for the Almost Home Wellness Center. Berkeley Heights-based Home for Good Dog Rescue is thrilled that SEPHORA Short Hills has chosen to be its partner in the corporate “Values Inside Out” program, which helps individual stores give back to deserving local non-profits and show the world that beauty comes from inside and out…. Three New Jersey teenagers will join Home for Good Dog Rescue on July 13 to pull dogs from high-kill shelters throughout South Carolina and Georgia as part of the organization’s Junior Ambassador Program…. Home for Good Dog Rescue is thrilled that SEPHORA Short Hills has chosen to be its partner in the corporate “Values Inside Out” program, which helps individual stores give back to deserving local non-profits and show the world that beauty comes from inside and out…. After surviving both the loss of his left eye and an emergency surgery, a rescue dog named Blink arrived in New Jersey by plane this week as part of a mission flown by FlyPups, Inc…. Behind a brick house off Whiskey Road on Tuesday morning, three teenagers were smiling and laughing as they petted, picked up, hugged and kissed several dogs. The girls weren’t just having fun with the animals; they were socializing them to get them ready to be adopted by families in New Jersey…. Three New Jersey teenagers will join Berkeley Heights-based Home for Good Dog Rescue on July 13 to pull dogs from high-kill shelters throughout South Carolina and Georgia as part of the organization’s Junior Ambassador Program…. Twenty-one dogs were flown to Morristown Airport Sunday afternoon for a live-saving mission. The dogs, brought to Morristown by Flypups.org, were strays or from high-kill shelters in Aiken, S.C., and Augusta and Millen, Ga. Home For Good Dog Rescue spares the life of the dogs, working to find homes for their adoption, rather than have them put down at the shelters…. This issue featured an interview with Home for Good Dog Rescue’s founder on the origins of the rescue and its ongoing mission. This January, it was announced that Home for Good Dog Rescue, based in Berkeley Heights, New Jersey, will be opening a wellness center in Aiken. This facility, called Almost Home, will serve as a halfway house for dogs coming out of shelters…. On Saturday, February 7, Home for Good Dog Rescue, a nonprofit animal rescue organization, kicked off their Almost Home campaign, which will establish a state-of-the-art wellness center for rescuing dogs in South Carolina…. This issue features a calendar listing for an adoption and fostering open house. Home for Good Dog Rescue aims to build wellness center in S.C.
Before Home for Good Dog Rescue can offer dogs for adoption, it rescues them from high-kill shelters in South Carolina and Georgia. The non-profit canine rescue group is launching a $2.5 million capital campaign to build a half-way house, or wellness center, for the dogs they rescue in Aiken, South Carolina…. This issue features a calendar listing for a upcoming fundraisers to support Almost Home’s construction. Home For Good Dog Rescue, which announced its plan to build a canine wellness center on Whiskey Road on Thursday, saves dogs that are in danger of being euthanized at high-kill shelters in South Carolina and Georgia…. Some might call it a holiday miracle, others a good deed, but there’s no doubt that Home For Good Dog Rescue saved another eight dogs this week…. The Farm at Green Village will host a Home for Good Dog rescue dog adoption event on Oct. 11 from 11 a.m. to 4 p.m…. Home for Good Dog Rescue (HFGDR) announced on Thursday Oct. 9, a new partnership with the Connecticut based T.A.I.L.S. organization in a life saving initiative to benefit animal rescue efforts on behalf of the Emanuel County Animal Shelter in Swainsboro, Georgia…. This issue featured an event listing for Home for Good Dog Rescue’s ‘Howl-o-Ween’ Party at Morristown Municipal Airport. This issue features a calendar listing for Home for Good’s “Howl-o-Ween” Party, hosted at Morristown Municipal Airport. Home for Good Dog Rescue of Berkeley Heights celebrated the occasion of its 3,000th pet adoption on Sept. 6 at a “Bark-a-Que” event on the village green in Summit…. Home for Good Dog Rescue reached an important milestone as the organization celebrated its 3,000th adoption on Sept. 6. More than 3,000 people attended the nonprofit’s fourth Bark-A-Que event on Summit’s Village Green where 26 rescued dogs were adopted…. Home for Good Dog Rescue held its fourth annual Bark-A-Que on Saturday, Sept. 6, on the Village Green. It seemed as though every dog in the area brought its owners to the event. Everywhere you looked there were dogs of all shapes, sizes and breeds. Many of them wore “I was rescued” scarves around their necks…. This issue features a calendar listing for a Home for Good’s “Howl-a-Ween” Party. Home for Good Dog Rescue will celebrate the adoption of 3,000 rescued dogs since the group’s inception in 2010 at the 4th annual Bark-A-Que event…. Friends, supporters and art students gathered to celebrate the official launch of Bottle & Bottega’s permanent studio on Thursday, July 31…. Home For Good Dog Rescue, which has its offices in Berkeley Heights, held an adoption event at PetSmart in Millburn on Saturday, July 26. The group brought 27 dogs to the event, including some puppies and a few older dogs rescued from high-kill shelters in the south…. On July 31, Bottle & Bottega, a pop-up art and wine studio, will celebrate the launch of its new permanent studio location in Berkeley Heights at 472 Springfield Ave. The new studio is conveniently situated at the corner of Summit Avenue, two blocks from the Berkeley Heights train station…. The Long Hill Community Center was filled to capacity on Saturday evening, March 8, during the Home For Good Dog Rescue’s fifth annual Taste of Italy Dinner and Tricky Tray…. At it turns out, dogs can fly. Well, they can with the help of Pilots N Paws, a nonprofit organization that helps facilitate connections between those willing to rescue, shelter or foster animals and volunteer pilots or plane owners willing to transport them…. The search for Mocha is over and he’s home with his family in Berkeley Heights. But it took three weeks of searching, the help of dozens, perhaps thousands, of people and one very good Samaritan to make this tale have a happy ending…. Home for Good Dog Rescue does not have a shelter. Instead, they have a Foster Program with a network of foster families in the Summit area…. The Summit Village Green went to the dogs on Saturday as Home for Good Dog Rescue held its third annual Bark-A-Que…. On Saturday, August 3rd, Pilots N Paws (www.pilotsnpaws.org) flew in a group of six lucky dogs from Georgia to New Jersey. One of these six would be Home for Good Dog Rescue’s (HFGDR) 2,000th adoption. HFGDR is a 100% foster-based rescue located in New Jersey who teamed up with Pilots N Paws to fly rescues to New Jersey to start their new life…. On Sunday, July 7 at around 5 p.m., 15 puppies and dogs landed at the Morristown Airport, marking the beginning of their second chance. Dirk van der Sterre, Owner/Manager of FTC FBO at Morristown Airport, witnessed an airplane transport come in to his airport on May 16…. Non-profit organizations Home for Good Dog Rescue and Pilots N Paws teamed up to give twenty-two puppies and dogs the flight of their lives. Home for Good Dog Rescue is a foster-based rescue in Summit, New Jersey. They first started working with Pilots N Paws, a group that connects volunteer pilots with animal rescues, in January. The groups have formed a relationship and continue to work together to save the lives of innocent animals…. Three-legged puppy needing new home arrives in N.J.
Princess and 18 other pups arrived at 6:30 a.m. Thursday, June 20, at Home for Good Dog Rescue’s office in Berkeley Heights…. On Thursday, June 27, 19 puppies and dogs, including a three-legged puppy, will arrive in New Jersey after a trip from Georgia to find their forever homes…. Summit-based non-profit Home For Good Dog Rescue is currently working with Pilots N Paws to fly in a new six-month old puppy rescue named Princess from Georgia…. Dozens of dogs needing new homes were available for adoption on Saturday on the Village Green. Most of the dogs had only been in the state since Thursday, May 16, when they arrived at Morristown Airport…. Dozens of dogs needing new homes were available for adoption on Saturday on the Village Green…. “Flying Home for Good” Flyway TODAY May 16, 2013—Stay tuned for live updates! Elroy is a 9-month-old German shepherd/retreiver mix in the care of Home for Good Dog Rescue. He came to New Jersey from South Carolina on a “Pilots N Paws” rescue flight along with nine other dogs saved from high-kill shelters. Elroy is described by volunteers as a sweet but shy dog. He would benefit from canine companionship, so his new owner would ideally have another dog. Elroy has been neutered and is up-to-date on shots…. A new foster family is the Farrell family of Cedar Knolls. They are ,from left, David Farrell, 7, mom Ann Farrell, 8-week-old puppy Daphne, Andrew Farrell. 5 with pilot Nick O’Connell behind them on his plane…. On March 9, Home for Good Dog Rescue hosted its fourth annual Taste of Italy Dinner and Tricky Tray at Long Hill Community Center in Stirling. More than 300 people were in attendance including the Mayor of Summit, Ellen Dickson, who spoke during the opening remarks…. This charitable organization funded solely by generous New Jersey residents, businesses, and foundations, helps dogs avoid being euthanized in the large shelters by providing all necessary medical needs, including vaccinations, so the animals can find a great home…. Home for Good Dog Rescue teamed up with Pilots N Paws on the afternoon of Sunday, January 27th to fly four lucky dogs from South Carolina to New Jersey. On a recent trip to Georgia and South Carolina, Home for Good founders and the Director of Marketing and Operations went on a mission to save over 100 dogs from euthanasia. The organization takes trips to the South to pull dogs from shelters and to visit their local fosters. Once a year, they invite volunteers to accompany them on a trip to see first-hand what the organization is all about…. Home for Good Dog Rescue, a Summit-based foster center for dogs, gave four lucky canines a soaring start for great new lives on Sunday at Monmouth Executive Airport…. On behalf of the Home for Good Dog officers, trustees and volunteers, we would like to express our heartfelt gratitude for all who participated in our second annual Bark-a-Que on Saturday, Sept. 8. Raffles, food and fun were had by all that joined us at the Village Green in Summit…. Home for Good Dog Rescue (homeforgooddogs.org) is having an adoption event on Saturday, Aug, 11, from 11 a.m. to 4 p.m. at PetSmart, 187 Millburn Ave., Millburn…. The council chambers went to the dogs on June 6 — or at least to one dog, Carson. Carson is the 1,000th dog adopted out by Home for Good Dog Rescue…. On Saturday April 28, Home for Good Dog Rescue sponsored their first dog adoption day at the newly opened PetSmart, located at 132 Route 31, Flemington. The event was a success as 17 dogs were united with their new “forever families.” Home for Good Dog Rescue holds adoption events on weekends at various pet supply stores in the Essex, Morris and Union County region…. This issue featured a calendar listed of an adoption, volunteer, and foster open house opportunity. New Providence Girl Scout Troop 45878 held a bake sale at the Millburn PetSmart April 14. The event ran concurrently with the Summit-based Home for Good Dog Rescue adoption event…. On Saturday, March 10, Home for Good Dog Rescue will be hosting their Annual Spaghetti and Meatball Dinner and Tricky Tray. The event is a major fund-raiser for the non-profit organization, which is based in Summit…. A fairly young rescue group with a successful, unique approach to adoption caught our attention this month, and we thought you should get to know them a little better…. Tails wagged, hearts leaped, and applause filled the PetSmart pet supplies store in Millburn recently as Summit’s Home for Good Dog Rescue marked its 300th dog adoption since being founded in August of last year. Home for Good Means Happy Families and Pups! Tails wagged, hearts leaped, and applause filled the PetSmart in Millburn on March 12, when Home for Good Dog Rescue marked its 300th dog adoption since its founding….